Peacefully, after a full and wonderful life, Gordon Frank "Fish" Burnett passed away April 14, 2012 at the age of 87 years. 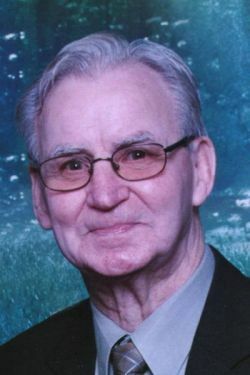 Dad will be forever loved and sadly missed by his 7 children, Darlene (Glen) Keller, of Winnipeg, Linda (Gil) Carriere of Lewistown, MT., Doug (Marian) Burnett of Duncan, B.C., Joanne (John) Simperl of Thunder Bay, ON., Bev (Blair) Haas of Selkirk, Lori (Gerald) Obie of Beausejour, Maury (C.C.) Burnett of Alexandria, MN., and step daughter Patti Lamoureux of Winnipeg. He will be greatly missed by his grandchildren, great grandchildren and extended family. Gordon was born September 21, 1924 in Miami, Mb. His early years were spent on the family farm in the Tobacco Creek district. He attended Sharon School where many stories and memories were created. Dad married Noreen McIntosh on Oct 22, 1948 and their life together took them from the family farm, to Miami and then on to Beausejour, where he worked at Garson Quarries and AECL at Pinawa. During this time he became an avid golfer and was involved in Maury's hockey. Retirement brought trips down south, horse racing, watching curling, casinos trips and visiting the family near and far. After Mom passed away Dad married Eva Kusturok. They resided in Miami, where they enjoyed the Friendship Centre, dancing, fiddle contests, and many many games of cribbage. Friendships were renewed and much joy was back in his life. Recently due to is health issues he moved to Selkirk Mb to be closer to his daughters . If you knew Dad, you remember his gentle nature, infectious laugh, and his love for life. Special thanks to homecare workers at Woodland Court and the staff at Tudor House, that supported Dad with countless acts of kindness. Funeral Service will be held Wednesday April, 18 at 2 p.m. at the Miami Community Hall, Miami, MB. In lieu of flowers, donation to Miami Friendship Centre or a charity of your choice would be greatly appreciated. "All right then, we'll see ya SWEETIE"